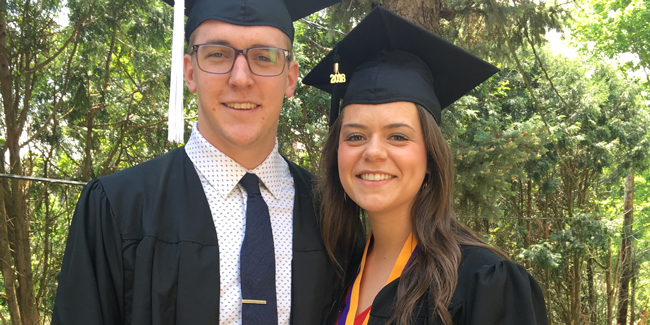 Dupaco's Crystal Kleitsch poses for a photo with fiancé Derek on their college graduation day. Congratulations! You’ve crossed the graduation stage with your diploma in hand—and the future ahead of you. But weeks are turning into months, and you haven’t landed your first Real World Job. Now what? As a recent college graduate myself, I get it. Taking the time to find a good starting position is tough. And with a bachelor’s degree becoming more common, it’s even more difficult to differentiate yourself from other applicants. |1| Live like a college student. Financial literacy junkie Adam Carroll offered this advice during a conference I attended: Live like a college student—even when you’re not in college anymore. If you can, don’t buy a new or used car unless you truly need one. Otherwise, you’ll be stuck with car payments on top of student loan payments and other expenses. Don’t eat out as much, and limit your activities to a moderate amount. I know it doesn’t sound fun, but it’s often necessary until those full-time paychecks start hitting your checking account. |2| Consider moving back home. Don’t be afraid to move home if your parents are OK with that while you get on your feet. It might not feel as “adultish” as you have been fantasizing about, but it will save you a lot of monthly expenses. While you look for that first post-college job, look for a paid internship or a traditional part-time job. Having at least a part-time income is important as you prepare for bigger expenses and purchases down the road. |4| Get a handle on your student loans. How long are you projected to pay on these loans? How many loans do you have in total? When I was getting ready to graduate, I created a spreadsheet of all the monthly expenses I thought I would have. This was a tremendous resource as I was finalizing my income at Dupaco and apartment hunting. At one point, I found the nicest apartment that I couldn’t get out of my head. But when I crunched the numbers, it was way out of my budget. By the time I would have paid my student loans, groceries, renter’s insurance, gas and other bills, I wouldn’t have been able to afford my rent. This is where so many recent graduates go wrong. Those bright and shiny new cars, apartments and cell phones will still be there once you have a steadier income with less debt. Wait it out for now. |5| Ask questions about your loans. If you’re confused about your student loans, you have a few options. Check the details of your federal loans at www.studentloans.gov. The website does a great job of breaking down your loans in an easy-to-understand format. If things still aren’t making sense, go back to your college’s financial aid department and ask them to break it down for you. Private student loans are a little trickier. Start by going online to the company the loan came from. Don’t be afraid to pick up a phone and call as well. Take advantage of your loan deferment period, and start saving for those student loan payments and other expenses now. If money is coming in from a part-time job at a decent rate, start paying interest now to help you get money ahead in the future. While I caution against buying a new car right after graduation, sometimes it is necessary. The more money you can save for that down payment (or apartment), the better. |7| Be open to other opportunities. Graduates often want their dream job right away, but that’s often not the reality. That doesn’t mean opportunities shouldn’t be taken, though. Be open to taking a job a little out of your comfort zone or even your degree. You never know what lessons you can learn from a new experience. Plus, you can gain valuable connections and references, as well as expertise in an area that might make you more marketable down the road. |8| Get a Money Makeover. Dupaco has a wide variety of resources available to help recent college graduates. If you find yourself in a situation that’s leaving your budget tight, request a free Money Makeover. Budgeting tools are endless, and we can look at what you’re spending your money on, where you can cut back and how you can save more. We also can look at your credit and help you establish, maintain or restore it. If your student loans are weighing you down, we can look at refinance options. |9| Stay on top of student loan payments. Student loans don’t go away. They will follow you to the grave if they must! Because of this, paying student loans on time—and the full payment—is extremely important. If these loans aren’t paid, it will drastically impact your credit score, which is used for so many things: buying a car, renting an apartment, insurance and interest rates, getting a job and more. If you’re in a situation where you can’t afford your student loan payments, the first step is to always communicate. Talk to someone from where your loan is from. Then, schedule that Money Makeover. Graduating college and entering the real world can be scary, but patience will take you far. Understand this is the path you must take for now, but the rest will come with time. Don’t be discouraged if finding a job, handling a tight budget or paying your student loans feels overwhelming. Dupaco is always here to help, and we will try our best to make your financial situation work for you. Meanwhile, enjoy the ride until you land that job that wakes you up every morning ready to conquer the world!